Sorry about not posting last night but I got home late from our monthly bunco and was pooped! What did I weigh yesterday?? Hmmm....I think it was something like 139.4. Dang monthly water retention! I can't really blame today's weight on female problems, it was more like two helpings of Indian and Persian food and two helpings of trifle....more on that later. Breakfast was Fage yogurt with a tablespoon of sugar free strawberry jam mixed it, a half cup of fiber one, a half cup of strawberries and a handful of blueberries. Finally a pic!!! I did manage to take a pic of the lovely orange the sushi chef carved up for us! We did some grocery shopping at Trader Joes and then I went home to start prepping for our bunco party. We have bunco once a month and someone's house. We don't play bunco anymore....just eat, drink and be merry! So this month our festivities took place at Dina's house. Dina enlisted my culinary help and we decided to make it a group effort. 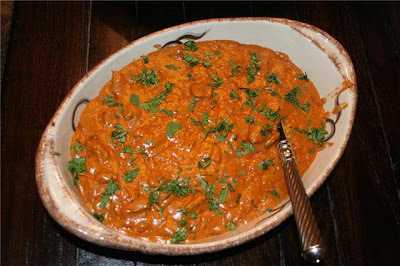 She prepared some fabulous Persian dishes and I whipped up my favorite recipe ever: Indian Butter Chicken. This stuff is sinful. After getting all my ingredients ready, I packed my stuff and drove the 3 minutes to Dina's and the fun began. I started getting my appetizer ready: Spinach Brownies. No.....they aren't really brownies with spinach. It's a silly name but I got the recipe from allrecipes.com and that was it's name. I tweaked the recipe a bit according to the reviews and it turned out fabulous!! Preheat oven to 375˚. Lightly grease a 9x13 inch baking dish. Saute onions and garlic in butter and then add the spinach to wilt down. Set aside to cool. In a large bowl, mix flour, salt and baking powder. Stir in eggs and milk. Mix in the spinach mixture. Add most of the mozzarella cheese, salt and pepper, cayenne and red pepper flakes and combine. Transfer the mixture to the prepared baking dish. Top with the remaining mozzarella, parmesan and feta cheeses. Bake in the preheated oven 30 to 35 minutes, or until a toothpick inserted in the center comes out clean. Cool a bit before serving. Now....moving on. While all this fabulous cooking was going on, I was sipping on, quite possibly, the best beverage on the planet. Dina was so kind to buy me some almond flavored champagne. I was in love. I didn't get pictures of the two Persian stews Dina made but they were excellent!!! And the most amazing trifle that Dina made (brownies, Kahlua, chocolate pudding, cool whip and Health Bar). Um, I could die right now. Yes, I had two huge helpings and I'm not ashamed. It was such a fun night....hanging out with friends and eating lots of yummy food! And don't forget the almond champagne!!! So...here we are with today's recap. Nothing as exciting as yesterday I'm afraid. Breakfast was a light multi grain english muffin with a tablespoon of almond butter and a half cup of strawberries. No pic, sorry. Dropped the kids at school and went to Step and Sculpt. Had an amazing full body workout and then ran a bunch of errands. Lunch was a Subway 6 inch turkey on wheat with everything (no olives!). I stopped by another self serve frozen yogurt place (Cool Cravings) and had half cake batter, half chocolate. Very tasty!! Got my nails and toes done and came home to relax. The hubby is gone tonight so....you guessed it....spaghetti time! Dessert was a vanilla skinny cow ice cream sandwich with some sugar free hot fudge on top. This food looks amazing and I am going to try your butter chicken recipe, we have been looking for a good one that is as close as possible to the real thing! OH my....you have to try it! It's quite possibly my favorite food ever. #1 Almond Champagne is my FAVORITE! #2 Your Indian dish looks amazing! I actually JUST tried Indian for the first time this weeked and whatever I got looked very similar to what you made. Ugh it looks sooooo good! How did I not know about almond champagne before!?! The first time I tried Indian I was hooked. This recipe is by far my very favorite. Thanks for the fabulous recipe I cant wait to try it out ! ps I love your kitchen!